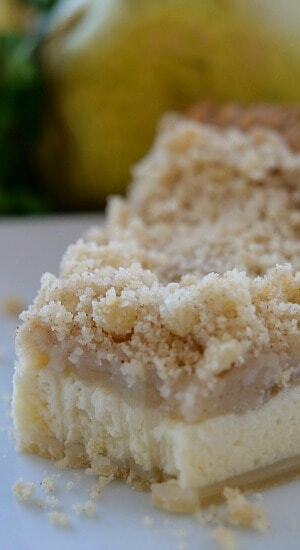 This fresh pear pie recipe is loaded with fresh juicy Bartlett pears, has a creamy, custard-like filling, and a crunchy streusel topping. 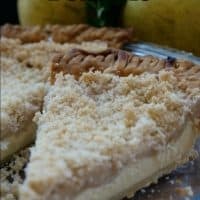 Definitely a family favorite pear pie recipe with our family and one that will fast become a favorite with your family as well. 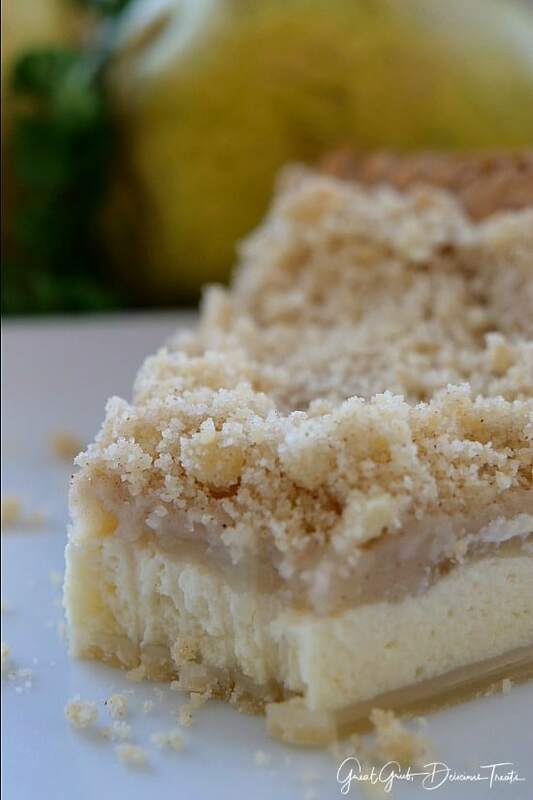 Pear pie is perfect for any time of the year because canned pears can be substituted when fresh pears are not in season. 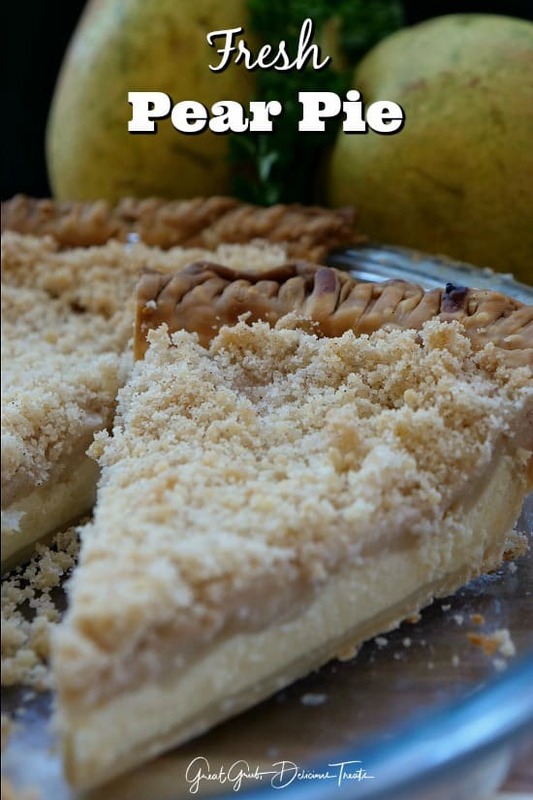 Do you have a favorite fresh pear pie recipe? This pie is a perfect dessert to serve anytime and year round. 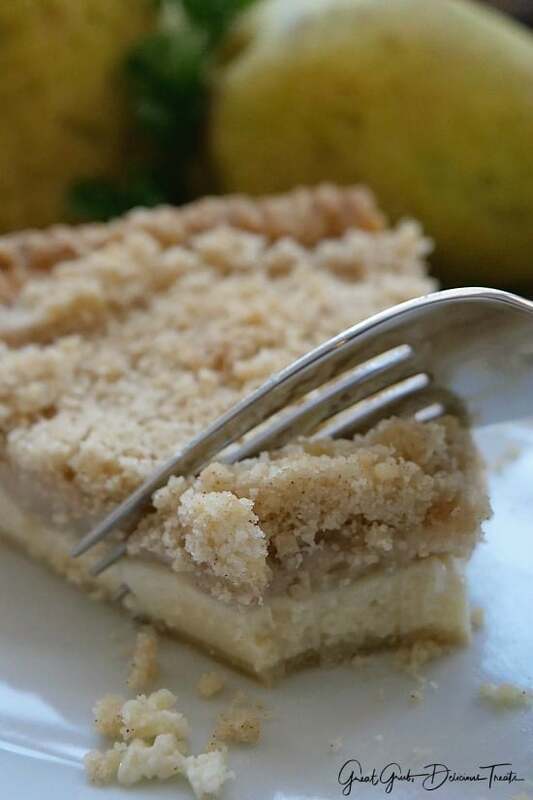 Actually, anytime you have a hankering for a delicious pear pie, then this is the one to make. And, it’s best to serve this pie cold. It tastes great right out of the oven but for the best results and for the most amazing taste and flavor, cold is best. Trust me on this one. So after it’s made, try to hold off on cutting a piece and once it cools down, put it in the fridge to chill. It’s SO GOOD! 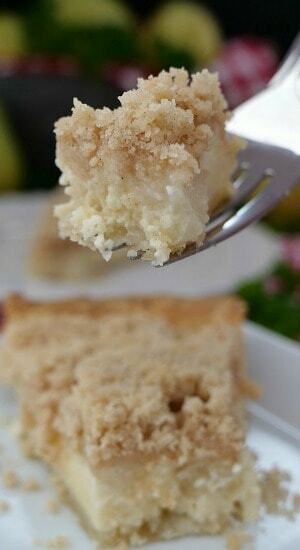 My sister, Linda, gave me this recipe and said it is my nephew’s favorite pie ever! This fresh pear pie is what Nicholas requests every year for his birthday. I mean, for a kid, now a grown adult, to want this pear pie over all the other desserts available on his special day, this has got to be delicious. Naturally, I had to give his favorite pie a try. Oh man, it’s so good that I’ve made it twice in one week. Thanks Linda for another delicious recipe. 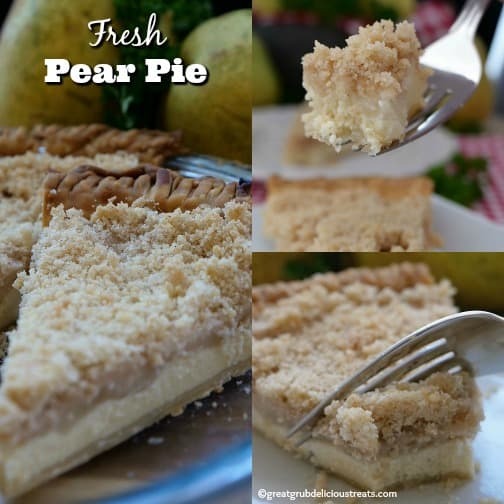 I’ve made this pie with both fresh pears and canned pears. Fresh pears are best but canned pears are great because you can still make this pie when pears are not in season. This is delicious with fresh peaches as well, which I’ll be sharing with you later. This incredibly delicious pear pie has sour cream in the filling. Seriously, this is one of the reasons the filling is so creamy and custard like. And one thing, you can’t even taste the sour cream. Such an incredible tasting pie. 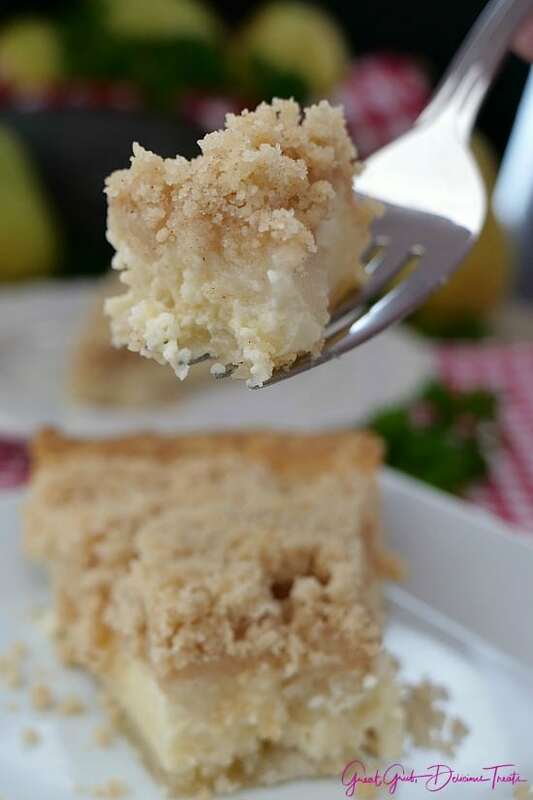 Here are a few more delicious fruit filled dessert recipes you can find on the blog: Fresh Peach Cobbler, Apple Pear Walnut Crisp, Pink Dessert, Caramel Apple Pecan Cobbler, and how about a delicious Peach Maple Pecan Crumble, plus many more. This is my nephew's Nicholas' favorite pie ever! Always asks for it on his birthday. Preheat oven to 350° and place pie crust onto pie plate. Poke bottom 4 or 5 times with a fork. Pour into a prepared pie shell. Peel, seed, slice pears and arrange slices evenly on top of filling. Bake for 15 minutes, then remove from oven. In a small mixing bowl, mix all ingredients with a fork until crumbly. Sprinkle evenly on top of pears and bake for 30-40 minutes until set. Remove from oven and cool completely. Cover and refrigerate. Best serve cold. Recipe from my sister, Linda.